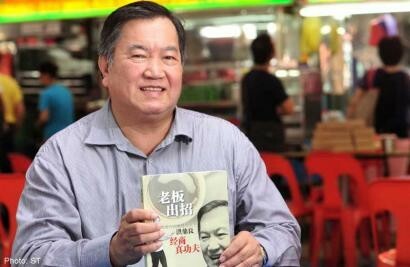 WHEN "coffee shop king" Hoon Thing Leong published his first book last month, all 10,000 copies were snapped up within five days. The Chinese book, The Boss Strikes - Effective Business Practices, made him a best-selling author overnight, thanks to support from an informal network of mainly Chinese-educated businessmen and friends that he had founded 18 years ago. "I am surprised that so many wanted to read my book," said the man behind The Bosses Network, who operates the Kim San Leng chain of 32 coffee shops. The 65-year-old had compiled 80 of his recent weekly columns in Lianhe Wanbao in the book. In it, he revealed his past successes and failures, from working as a coffee boy in his father's shop in Hougang when he was 12, to starting his first coffee shop in Bukit Timah with a younger brother when he was 24. In 1990, he made the news when he paid a record $3.52 million for a coffee shop in Bishan Street 13. He still owns the shop, which is worth many times more today. His book is so popular that he has been invited to speak to businessmen in Taipei on Aug 26, at the invitation of a group of small and medium-sized enterprises (SMEs) there. A Secondary 2 school dropout, Mr Hoon was born in Fuzhou, China, and moved here with his mother when he was five to join his father who had arrived earlier. Married with three sons and two daughters, Mr Hoon has devoted his entire life to the coffee shop business. But it is his leadership in The Bosses Network for which he is better known today. Recalling how the group was founded, he said it all began with his need to upgrade himself in the early 1980s because he had little formal education. So he attended part-time business courses: the first was a business management certificate course in Chinese at the Singapore Institute of Management (SIM) in 1984. Motivated to learn from others' experiences, he never missed the chance to attend talks or forums on business and management. He would even travel overseas for such events as very few were conducted in Mandarin here. Over the years he attended hundreds of these short courses and talks, earning himself the nickname "professional student". He was so zealous a learner that he was honoured by the Success Motivation Institute in Texas, the United States, for being its Singapore Client of the Year in 1996. But he realised most talks were on direct marketing and selling, or were actually recruitment exercises for insurance agents, which he was not interested in. So in 1996, he and a few other like-minded Mandarin-speaking friends decided to start an informal group, to organise talks and forums and learn from one another. One other founding member, Mr Richard Toh, 54, who owns a printing and packaging company here, said: "When we started, there were only five of us and we would invite someone to speak to us over a meal. "When more people came to join us, we moved to community centres or hired lecture halls in commercial buildings where we could accommodate at least 50 to 100 people." Mr Hoon said the group, which has a few volunteers, now organises talks and sessions almost every other week, where professionals from different fields are invited to speak. Average attendance is between 200 and 300 people, but a popular speaker can attract a crowd of up to 600. About 11 years ago, the group partnered Shin Min Daily News in starting an annual three-day cruise event. Up to 700 members join the cruise each year, where talks and workshops are organised for them. And four years ago, it also started hosting its regular "round table" lunch meetings with top businessmen, government officials and ministers. At each meeting, about 20 of its members gather to raise issues with the authorities. Senior Minister of State for Finance and Transport Josephine Teo, who met the group at the Shangri-La Hotel last month, said: "I like the informal setting because I can also be frank with them with my answers to the problems they raise." What accounts for the enthusiasm of Mr Hoon and his volunteers in organising talks and forums? Said Mr Hoon, who has also been a grassroots leader in Bishan since 1992: "This is public service, and we are happy we can help others in business in this way."